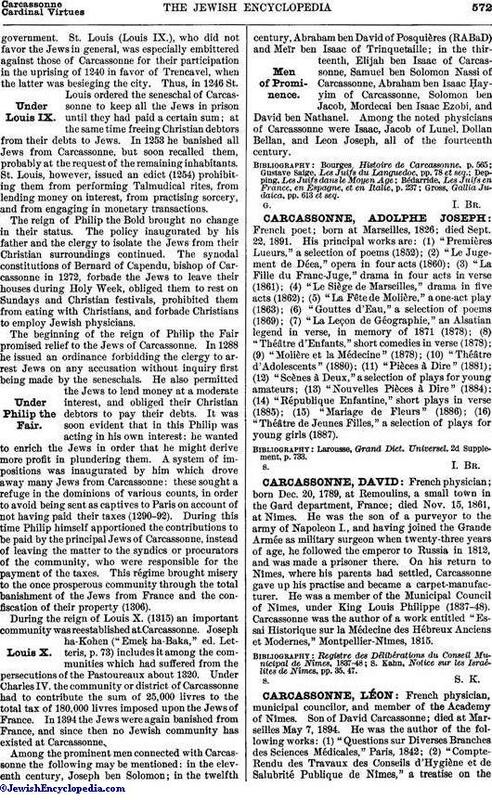 French physician; born Dec. 20, 1789, at Remoulins, a small town in the Gard department, France; died Nov. 15, 1861, at Nîmes. He was the son of a purveyor to the army of Napoleon I., and having joined the Grande Armée as military surgeon when twenty-three years of age, he followed the emperor to Russia in 1812, and was made a prisoner there. On his return to Nîmes, where his parents had settled, Carcassonne gave up his practise and became a carpet-manufacturer. He was a member of the Municipal Council of Nîmes, under King Louis Philippe (1837-48). Carcassonne was the author of a work entitled "Essai Historique sur la Médecine des Hébreux Anciens et Modernes," Montpellier-Nîmes, 1815. S. Kahn, Notice sur les Israélites de Nîmes, pp. 35, 47.